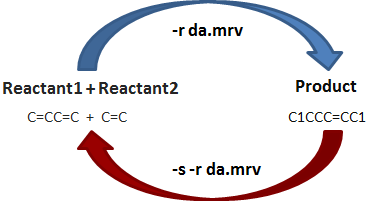 The command line parameter --reverse (-s) specifies that the reversed reaction will be performed; that is, the two sides of the given reaction equation are swapped: products are taken as reactants and reactants are taken as products. Note that in reverse mode, the number of input file(s)/string(s) should match the number of product(s) of the reaction equation to be applied. react -s -r da.mrv "C1CCC=CC1"
Note: Results are written to the console.